Is Skechers Stock a Buy After Getting Cut in Half? 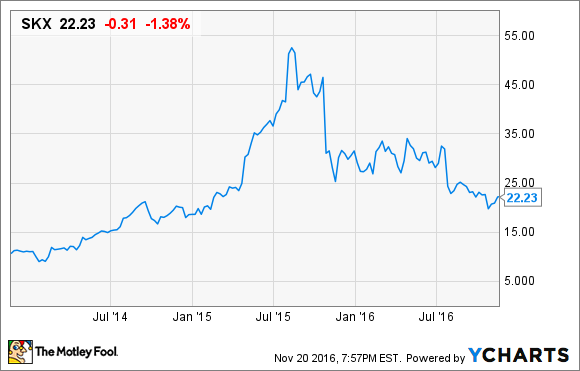 Skechers stock has lost half its value in a little over a year -- but could it be ready for a rebound? Skechers store in Las Vegas. Photo by the author. Skechers USA (NYSE:SKX) stock has fallen from a high of around $50 in mid-2015 to just $22 as of Nov. 21. Even though analysts had been bullish on the stock as Skechers started to become a dominant force in the industry, the most recent sales numbers show that continuing to grow quickly in this industry with behemoths like Nike (NYSE:NKE) and Adidas (NASDAQOTH:ADDYY), as well as other aggressive young companies like Under Armour (NYSE:UAA)(NYSE:UA), would be harder than it seemed at first. After getting cut in half, is Skechers stock now appropriately valued for potential long-term gains? Skechers has worked hard in the past few years to change its image from a low-price seller to a serious athletic and fashion footwear brand. To achieve this, the company started to sponsor professional athletes like golfer Matt Kuchar, who took bronze in the Rio Olympics in Skechers golf shoes, as well as celebrities like singer Demi Lovato, who has a large social media audience as an advocate for the brand. Skechers has also increased its selling prices to put some of its higher-end shoes in the same category as other higher-end shoes in the marketplace. Skechers' transformation seemed to be working, as the company overtook Adidas as the No. 2 footwear seller in the U.S., behind Nike, in 2015. Over the last few quarters, however, sales growth has started to slow. In the most recent earnings report, for the period ended Sept. 30, Skechers' sales of $942.4 million were still up more than 10% year over year, but that figure is down from growth of 32% year over year in fiscal year 2015. Additionally, while gross profit expanded 40 basis points thanks to higher-priced shoes, net profit of $65.1 million, or $0.42 per share, was down about 2.5% from the third quarter of 2015, as increased advertising costs pushed profit margin lower. While the third quarter was slower than hoped, fourth-quarter forecasts look even worse. Skechers is guiding for $710 million to $735 million sales in Q4, compared with $726.6 million in Q4 2015. In other words, the midpoint of that Q4 forecast would actually represent a sales decline, the first time that has happened in four years. Because of the lowered sales growth and weak guidance, Adidas has overtaken Skechers in the U.S. once again, and Under Armour's incredible footwear growth puts the younger company not far behind. As a result, analysts have started to turn bearish on Skechers, helping to push the stock lower. Skechers' recent sales growth looks concerning, and the fact that earnings are actually dropping doesn't look good for the stock. Still, Skechers has some very attractive features that shouldn't be overlooked. For one thing, the shoemaker still has plenty of international growth potential it is now tapping into. Skechers' international sales grew 18% during the quarter, and now make up around 40% of total sales. Following the earnings release, Skechers announced a new joint venture with a subsidiary in South Korea that should help to boost operations in the region, as well as new initiatives in China, which looks like Skechers' geography with the highest growth potential in years to come -- sales there surged 50% year over year in the most recent quarter. David Weinberg, the company's chief operating officer, said in the earnings call that there are now approximately 1,860 points of sale in China, as well as an extremely strong e-commerce business with high-double-digit growth. "We believe there is still tremendous opportunity across the country to further build the brand," Weinberg said. Other than international sales opportunities, Skechers boasts a balance sheet that is getting more robust, a good sign that the company can weather its transformation while investing for growth. Cash increased to $665 million during the quarter, up 30% from a year ago, with working capital up 23%, to $1.23 billion. The company has also been serious about decreasing its debt load (which wasn't excessive to begin with), and total liabilities in the quarter dropped 17% year over year. All of this means that Skechers has a lot of ability to invest in future growth through renewed capital allocation, particularly marketing initiatives related to international expansion. What's even more enticing for investors who believe Skechers does have the ability to grow sales further in the years ahead is that Skechers stock is trading at just 13 times earnings right now; the corresponding figure is 23 for Nike and 69 for Under Armour. Nike and Under Armour certainly look more exciting than Skechers from a growth perspective, but it's hard to overlook how much cheaper Skechers is. This low valuation assumes that Skechers has little chance for future growth, and while the company and stock could very well still suffer in the short term, in the long term the company looks to have plenty of ability for new investment and growing international sales, characteristics that make this stock look attractive now.